I had a chance to experience two of the worlds biggest flowers recently, only mere weeks apart. The first was the infamous corpse flower, amorphophallus titanum (which means giant misshapen phallus). 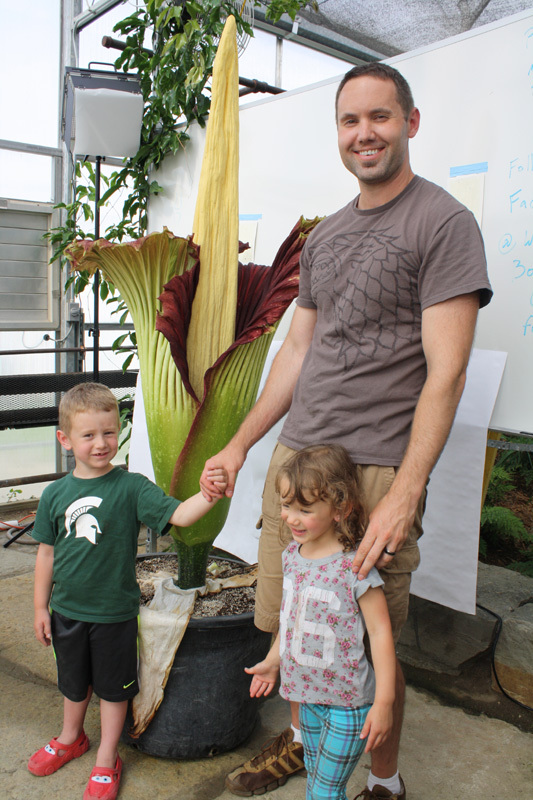 There is a specimen at MSU near my house that was flowering for the first time in years, and I dragged my kids there (they were troopers, waiting in line nearly 2 hours to see a stinky flower). It really is a rare chance, there aren’t a lot of them out there, and they can bloom as infrequently as every 10 years. Corpse flower, for scale I’m 6’5. The corpse flower is pretty cool, and is one of the largest flowers in the world. Technically they call it the largest unbranched infloresence in the world. It smelled like “squirrel in the ceiling” if you know what I mean, but it wasn’t overpowering, at least when I was in there, you had to stick you head down inside to sniff it (then again, they had the doors open and fans on so who knows). This flower is rare, but not necessarily out of the reach of the common gardener. It is native to Sumatra and so you need to live in a tropical region to grow it, or have a greenhouse, or an interior room with enough sunlight to hold it over for the winter (bringing it back outside when the weather warms up). It seems to grow a bit like an amaryllis where it’ll put up foliage, in this case a structure that looks like a small tree, until it has enough energy stored up to blossom, and then the foliage all dies back and later the flower comes up, only perhaps only once a decade (and then only for a few days). Pollination as such is difficult, only a couple more were blooming nationwide when the MSU flower was in bloom, and they were trying to use fedex to exchange pollen. So if you live in zone 10, or if you have a greenhouse or a room with enough sun exposure that can house such a large plant, you can indeed buy one of these, what a neat thing to have. If it blooms the kids can take it to school for show and tell. I’m thinking about it, for when I have my greenhouse. A few weeks later I was taken by my wife to some botanical gardens at UofM for our anniversary and there, at that time, they had a century plant blooming. Century plants are pretty crazy, they can live for 100 years, but then put up a super tall scape with flowers, and then die (not unlike bamboo I guess). I’ve seen them in bloom before, once when we went to Jamaica a bunch were in bloom and we saw them from the side of the road as we drove past. So this was both more rare and less rare than the corpse flower. It is more rare in the sense that the century plant only blooms once every 100 years (honestly, some varieties are much shorter in duration, but still measured in decades), it is less rare in that they’re all over the place, because of course, another name for the century plant is agave, and it is grown all over in warmer climates, and of course farmed for the tequila industry and for its nectar (sugar), which you’ve probably seen at the store. It was still cool seeing how they had to remove a panel from the top of the greenhouse to let the flower scape grow to the massive height it was heading to. 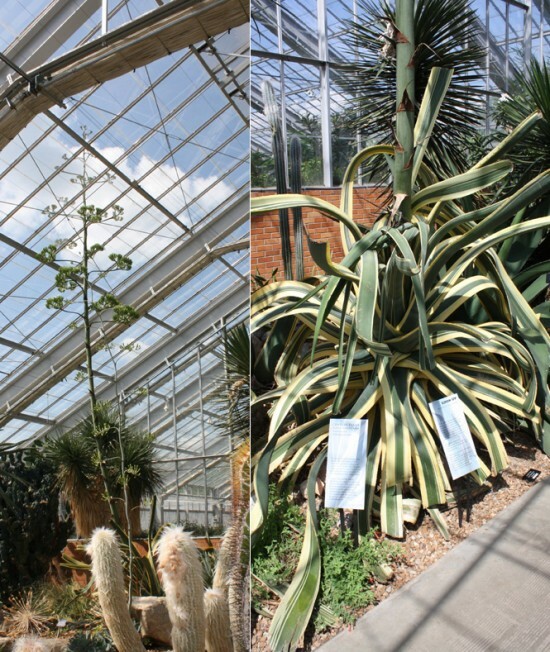 Wide shot on the left showing it towering up through the roof, the base of the plant on the right. It puts up that giant stalk in a short period of time after spending decades storing up the energy to do so. Growing this is even easier for the gardener, and in my opinion it has really attractive foliage that comes in all sorts of colors and is even variegated. Call it, the hosta of the desert maybe. So it is interesting to look at even when it isn’t blooming (dying, heh). While native to deserts of Mexico and Texas, there are cultivars that are hardy as far north as zone 7, and I swear I saw a zone 6 before. Definitely zone 6 if you can make a little microclimate, and of course, you could always plant it in a container if you have room to store it inside over the winter. I couldn’t grow any here in Michigan, but I definitely plan to plant some when I move down to Tennessee. They can be bought lots of places, but the best selection I’ve seen is here. Of course, being desert plants, they are drought tolerant like other succulents, and I shudder to meet the deer or other animal that’d want to take a bite out of them. They were both definitely interesting things to visit, especially considering both were rather impromptu excursions. It also was heart warming to see the length of the line to see the corpse flower. That that many people would stay in line that long to see a plant makes me think the future of gardening is bright. It also gave me an idea for an amusement park, who needs to build roller coasters? People will wait in line just to see a plant. As a Spartan alum, I have fond memories of the gardens at MSU. Thanks for sharing this pictures. I just found your blog today after I googled “garden blogs” and yours was #4 on a top 50 list! Anyhoo, I’m enjoying your posts as I sit here drinking my coffee and I couldn’t help but notice your House Stark shirt. Two topics I could literally talk all day about – Gardening and Game of Thrones (and the books, too). I’m going for a semi-themed garden this year by adding Little Finger carrots, the Gillyflower, and Jonquils to my beds. And I already have the yellow rose that is “growing strong”. I’m still on the search for more flowers or veggie types that share names with characters or were mentioned in the show and books. Too bad they don’t have blue roses that I could plant in honor of Lyanna Start. Any suggestions on GOT plants I may have overlooked? I’ve enjoyed your posts so far and I plan on exploring your blog even further. Happy spring!